Tucson brewery enlists the expertise of industry leading commercial furniture manufacturer to supply commercial chairs and bar stools. The Metal Ladder Back Chairs stand up to heavy usage without getting wobbly or breaking. Restaurant Furniture Supply recently helped Thunder Canyon Brewery in Tucson, Arizona update their seating by supplying them with new restaurant chairs and bar stools. Thunder Canyon Brewery began as one of only three Tucson breweries. As one of the leaders of the craft brew revolution in Tucson, the Thunder Canyon Brewery staff has helped to set the standard for new and local beers. They have two pubs in Tucson. Thunder Canyon Brewery plays an active role in the community and has strong ties to Tucson and its residents. Since opening in 1997, TCB has developed deep roots in their community which includes supporting local charities, school districts, and various police and fire departments. Thunder Canyon Brewery has become well-known for crafting great beer and making delicious food. They offer more than just typical pub food. The menu includes daily-made soups, salads, pizzas, burgers, and more. Everything is made in-house from our scratch-kitchen, from the salad dressings and home-baked bread to the fresh-ground burgers and spent-grain pizza dough. Much like their beers, they only use the freshest, high-quality ingredients. Healthy options are also a big part of our menu. They use only zero trans fat oils and welcome any substitutions. They also offer a number of homemade sodas and other non-alcoholic thirst quenchers. The pub for Thunder Canyon Brewery has a modern, industrial motif. The owner decided to renovate it and update the seating for the downtown pub. "He turned to Restaurant Furniture Supply for commercial chairs because of their reputation for excellent quality at affordable prices," explained sales person Chris K. "He opted to go with the Metal Ladder Back Chair with a black frame finish and solid wood seats along with matching bar stools. "The Metal Ladder Back Chair is one of our most popular chairs across America. As a pub with many visitors he knew that the restaurant would need durable chairs. The Metal Ladder Back Chairs stand up to heavy usage without getting wobbly or breaking, like a chair not constructed for commercial use would tend to do," Chris K. said. Restaurant Furniture Supply's Metal Ladder Back Chair is currently on sale for $35. The matching Ladder Back Metal Bar Stool sells for $56. Customers have the option of a solid wood seat or a high density foam padded seat. The padded seat is made in the USA and comes in vinyl or fabric in many different colors. A custom seat can also be upholstered in any material for an extra cost. The solid wood seat is available in cherry, dark mahogany, walnut, natural and black finishes. A custom finish can also be made. The frame comes in black, gold, copper vein, silver vein or gold vein. 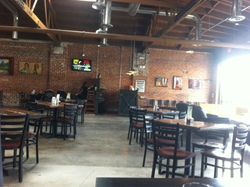 Thunder Canyon Brewery is located at 220 E. Broadway Blvd. in Tucson, AZ. They can be contacted at (520) 396-3480.